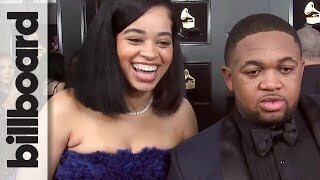 Ella Mai & DJ Mustard join Billboard on the red carpet of the 2019 Grammy Awards to talk about 'Boo'd' Up' winning Best R&B Song, Aretha Franklin, and more. The song of "He Started Crying": Ella Mai & DJ Mustard on Big Win for 'Boo'd' Up' | Grammys is just for review only. If you really love this song""He Started Crying": Ella Mai & DJ Mustard on Big Win for 'Boo'd' Up' | Grammys", please buy the original song to support author or singer of this song.